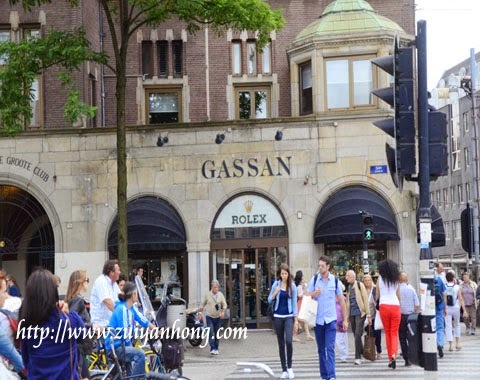 We walked to Dam Square after visiting Amsterdam Gassan Diamonds Headquarter. 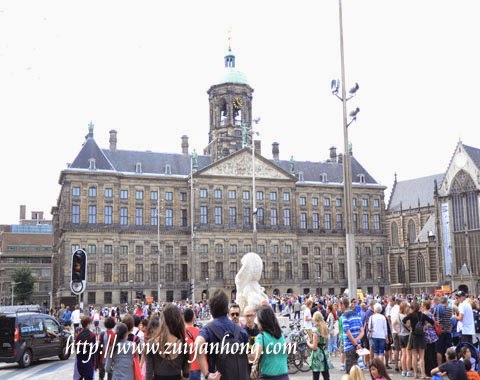 Dam Square is a very renowned tourist attraction in Amsterdam, the capital city of Netherlands. 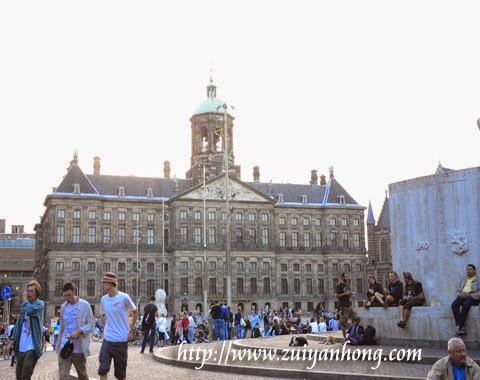 Dam Square is also an ideal meetup place for Amsterdam residents especially during holidays and weekends. 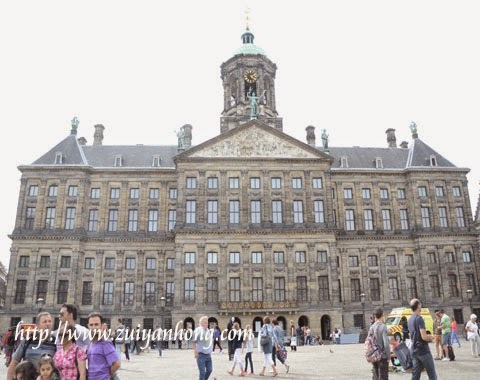 The magnificent building at the end of Dam Square is Dutch Royal Palace. Currently, the palace is turned into a museum for the public when the Dutch Royal Family not using it. 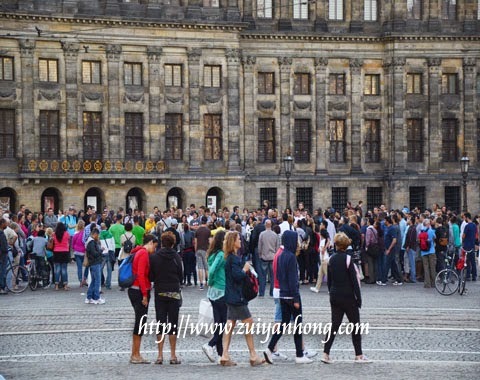 Recently, there was a "Silent Walk" around Dam Square. This event was organized for flight MH17 victims killed in the crash in eastern Ukraine. 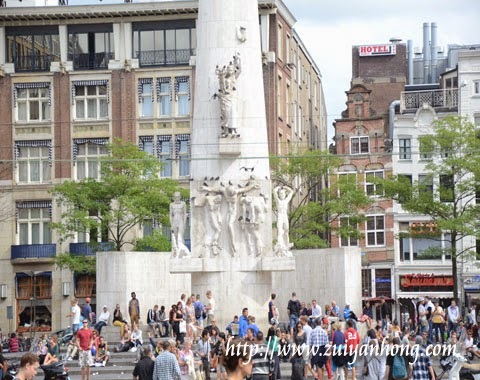 Various activities are held at Dam Square every day. A busker was dress up as a warrior of the old times. 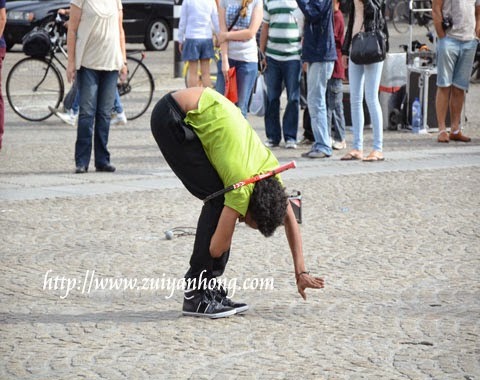 A group of youngsters were playing diabolo at Dam Square. I was surprised to see the Dutch playing diabolo. Another busker showed case his capability at Dam Square. This scenario is truly common at Dam Square. 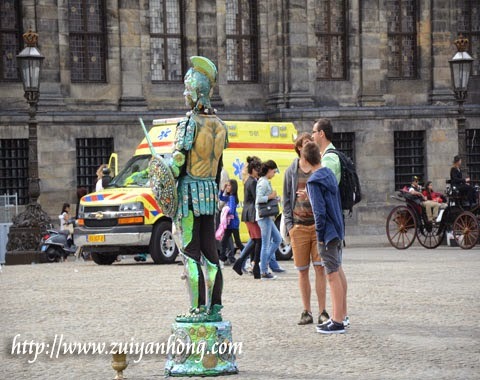 Many buskers display their talent at Dam Square. 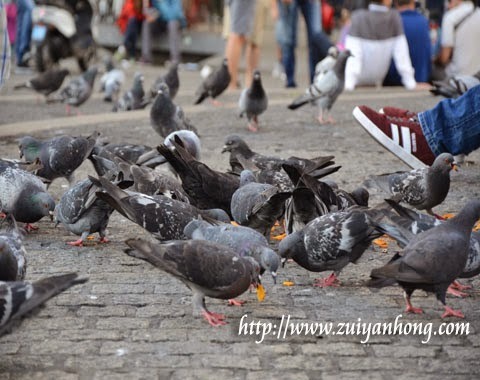 In addition to humans, pigeons also like to flock at Dam Square. Amsterdam pigeons are not afraid of people around them. They are enjoying snack with the visitors of Dam Square. 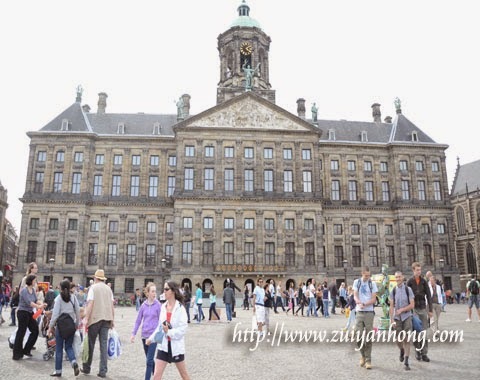 Dutch National Monument is opposite of Dutch Royal Palace. The monument was built to remember the casualties of World War II. A National Remembrance of the Dead Ceremony is held at the monument on 4 May every year. There are two white lion sculptures at both sides of National Monument. Information of these white lion sculptures is limited. 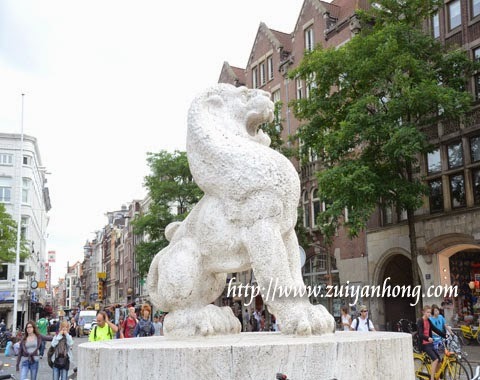 After searching from internet, I only know that the two white lion sculptures are symbolizing Netherlands. 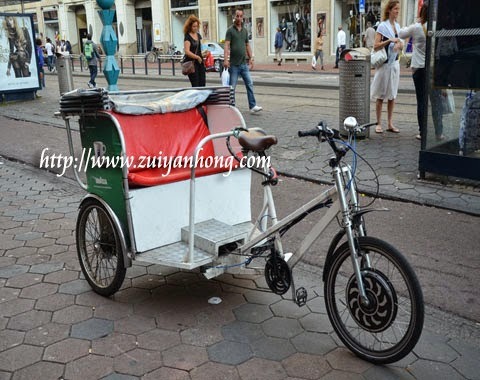 In case you are weary of walking, you can take a Dutch trishaw ride. I didn't see any tourist gets on the trishaw. No idea about the price of the trishaw ride. A tram was passing by Dam Square when we were hanging out there. Tram is one of the transport which is often used by tourists and residents of Amsterdam. This path is especially for cyclists. Beware of not step into the bicycle paths. If not you will knock by bicycle and get hurt. 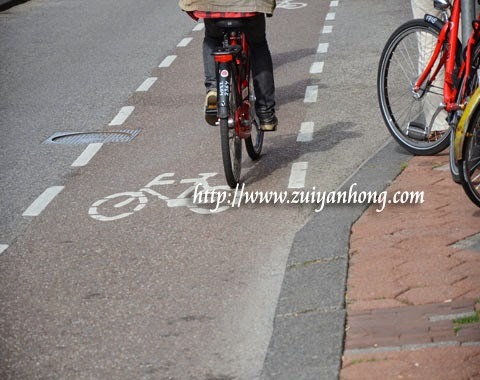 Apart from the bicycle paths, you should be alert when crossing the tram tracks. 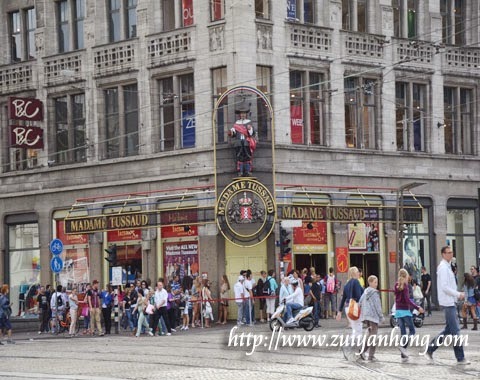 Madame Tussaud Museum is beside Dam Square. A group of people is queued outside the museum. Due to run out of time, we were unable to visit Madame Tussaud Museum. This is the photo of Gassan Diamonds Dam Branch. It happens that this Gassan outlet is opposite Madame Tussaud Museum. Apart from diamonds, a wide range of cutting edge watches and jewelries are available at Gassan Diamonds Dam Branch. De Bijenkorf in English means beehive. It's the biggest department store in Amsterdam. The department store building is six floors high. 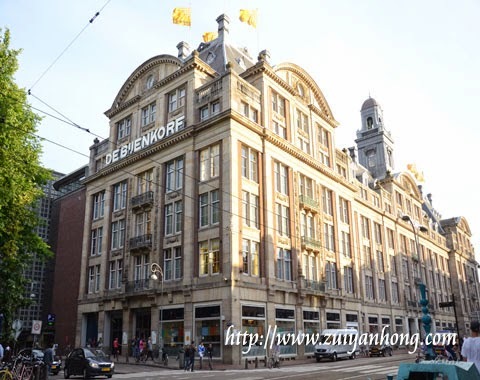 Don't miss to shop in De Bijenkorf when you are visiting Amsterdam. 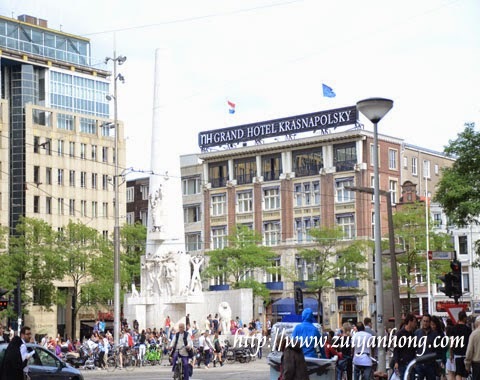 This is Dam Square NH Hotel. It's not the NH Hotel we stayed during our trip to Netherlands. We stayed in Schiphol NH Hotel which is not far away from Schipol Airport. As you can see from the above photo, NH Hotel is just behind of National Monument.